Orchard is Singapore’s version of Ginza. It is the high end of shopping and a place where people go to be seen. When someone is looking for high fashion items like the perfect Gucci bag, Orchard seems to be the place to go. I only spent a few hours in Orchard and I actually arrived a little early. I arrived in Orchard around 10:30, and most of the shops were still closed. I ended up wasting a bit of my time just walking around looking for shops that were open. It is very much like Ginza where things don’t really come alive until 11am, at best. I went into Orchard not really expecting too much as I don’t normally shop for high end items, but I ended up enjoying the experience. 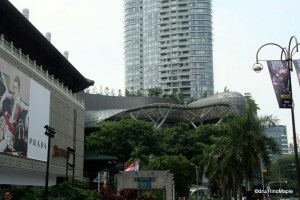 The main strip, Orchard Road, is where most of the shops are. There really isn’t much else to it, but there are a few places to visit on either side of the main strip. I found that if you go off the main strip, you can see a few cheaper shops compared to the luxury of Orchard. The main strip itself is a plethora of shopping malls and department stores. The anchor of Orchard has to be Tangs. 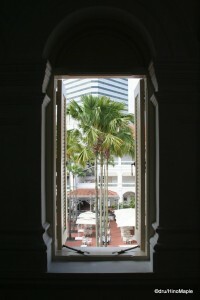 It is one of the oldest department stores in Orchard and a major retailer in Singapore. When they opened, Orchard was little more than a small residential and cemetery area. Once Tangs built their main shop, things started to change. It eventually turned into the high end shopping district it is today. The most common area is an area between Orchard Station and Dhoby Ghaut Station. It is a short walk between the stations and fairly easy, even on a very hot day. You can easily walk from mall to mall, department store to department store and only feel the heat a little. My only surprise was to see the many Japanese department stores. Unfortunately, some of them were just a pale comparison to their original counterparts in Japan, but there were many of them and the ones that spent money to be upscale were very much like their original counterparts. Orchard is also well known for its cafes and restaurants. Like any upscale shopping district, you need to have places for people to rest, relax, and eat. 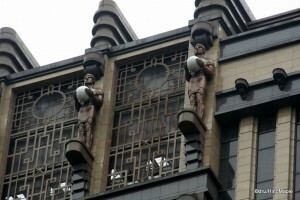 Statues atop a tall office building in Bugis. When visiting Singapore for the F1 Grand Prix, there are many things you can’t do. You can’t really experience the night life in Singapore. You spend most of the night at the race itself and after the race you are pretty tired. The Friday qualifying wasn’t too late but after walking around all day in the circuit, I just didn’t have any energy to keep going. On Saturday, the qualifying didn’t end till 11pm or so, which made it difficult to go out afterwards. By Sunday, I was just too tired from going everywhere possible. There are several places I wish I could have gone if I had more time and more flexibility to travel around Singapore. The first would be Sentosa Island. To me, it looks like nothing more than a Singapore version of Disney World. There are beaches, shopping malls, and other amusement attractions such as Universal Studios Singapore. It looked like a nice, expensive, place to visit. If I had more time, I would have spent a day just trying many things on the island. The other regret I had was not being able to go on a night safari. In Japan, a lot of Japanese people told me to go on a night safari, but since I was too busy with F1, there was no chance I could have gone on a safari. It seems interesting but at the same time it wasn’t high enough on my list of things to do in Singapore. One other regret is not getting out and around Singapore itself. Singapore is well connected to Malaysia as well as Indonesia. I wish I had a lot more time to visit one of the resort islands in the area, although travelling to Thailand might be a better idea due to the prices. Singapore is a wonderful country and it is a place I wish to re-visit in the future. There are many other places that I would love to visit but if the opportunity does arise, I will be heading to Singapore very quickly. Unfortunately, a short visit without knowing any locals probably created a tourist bubble around me and influenced my own impressions of Singapore. I wish I knew people who lived in Singapore to get a better idea as to how life really is, as I learned when I visited Hong Kong and Taiwan in the past. Hopefully I can revisit soon and get a better understanding of the people and culture that is unique to Singapore. This entry was posted in East Asia and tagged Dhoby Ghaut, Dhoby Ghaut Station, Indonesia, Malaysia, Night Safari, Orchard, Orchard Road, Orchard Road Station, Orchard Station, Sentosa, Sentosa Island, shopping, Singapore, Tangs, Thailand, Universal Studios Singapore by Dru. Bookmark the permalink.